A personal reflection on the relationship between gaming rules, reality and the ties that bind them together. 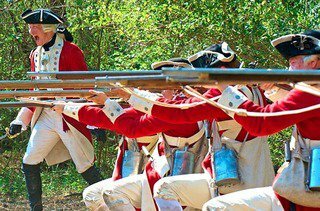 There I was, hiding inside a church on the Setauket green, my British troops – the 3rd battalion of DeLancey’s Brigade – surrounded on all sides by angry colonists and their artillery. Only a few turns ago, there were more men in the church with me. But, two units had been cut down by wave after wave of fire from the local militia and the Colonial regulars, such as they were. We had tried to charge the enemy, hoping his poor morale would crack and force a break in his lines, or perhaps even a general retreat. But, whether our side charged the rebellious colonists or they charged us, the fortunes of war – in this case the luck of the dice – denied the British side a victory. In truth, the dice delivered doom. We started one charge with 10 men, and finished with three. Another charge cut a nearly-full 10 man unit down to only two survivors. It was not a good day. It looked as if we would never make it to tea time. The game rules we were using were relatively simple. To shoot, you just measured the distance to your target, added or subtracted for terrain modifiers and rested weapons, and rolled. A good soldier could hit a target in medium cover by rolling 7 to 9 on a ten-sided die. After firing, the hits were totaled up and a special die gave the results of each hit. A wound to the hand or leg was considered a light wound, and the figure would get a plastic ring around its neck as a marker. A wound to the chest, stomach or head was fatal. Two light wounds were also fatal, and the unit commander would pick which of their soldiers were hit. Which brought up a question. Two, actually. If a soldier is shot in the arm or the hand – or foot or leg – shouldn’t they suffer some sort of penalty in melee and in shooting. Hard to aim if your arm is bleeding badly. Or charge if you can’t run. Angelo Giordano, our host and game master for the night – he loves the American Revolutionary War period – decided that light wounds should be ignored, on the grounds that adding another round of calculations for each figure would slow up the game too much, and that – if you hit enough of the enemy – they will eventually die. Long before that, he pointed out, unit morale weaken quickly as light wounds become fatal, and all the survivors break, wounded or not. After some minor grumbling, Angelo agreed that wounded troops should not get a charge bonus in hand to hand combat. His word was law, of course, as the game master he was – for the night – the Lord of the Rings. OK. Bad puns aside, by the time we had reached the end game the colonial rebels had swarmed over the works, surrounded the church, and the British reserve had come in, charged and died. 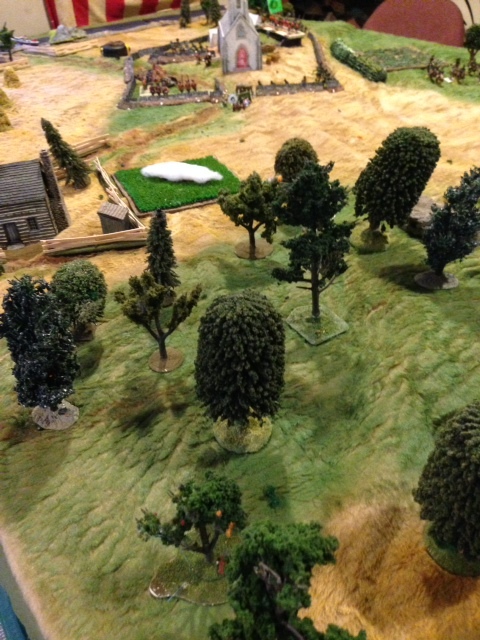 The poor remainder of our forces were huddling in hard cover and being whittled down, earning only a moral victory and getting a marginal victory for surviving until the end of the game. So, here’s the observation. As the game reached its climax, it became clear that a 10 man unit could suffer 10 light wounds and not lose any of its combat effectiveness. Of course, once they reached that point, any wound would spell the end of a soldier. And, as wounds build up, healthy soldiers get the “killed” result. You had the option of giving one of your men two light wounds and killing them off, but there was no real benefit to doing that. The system works out in a way that units soon have nothing but wounded soldiers. At first, it bothered me. I was getting charged by many lightly wounded men, and they were killing my troops with great dispatch. Toward the end, I had to agree with Angelo that the system keep the battle moving. It also mirrored what would be the likely result had several hundred men in medium or hard cover exchanged fire with weapons that were notoriously inaccurate. Still, it raised the question – why does it seem wrong to let wounded men shoot and charge at full strength. After all, it doesn’t seem wrong when you ignore the combat effects of a few holes in the hull of your destroyer or the protective advantages of rubble compared to the protection from a pill box. Part of me says that its just not right for wounded soldiers to kill my strong, healthy troops. (It also says that my wounded soldier can throw a hand grenade into a foxhole just as well as his healthy buddy). My rigid super-ego adult analyzes this all and says the odds table fails to reflect the relative strength and weakness of the soldiers, and should be modified. But, no one of them want to go through the extra calculations such factors would entail, or come up with an accurate formula to show just how much of a handicap being shot in the hand or foot really means in the few seconds it would take to resolve a real-life charge. And no, I’m not seeking sympathy for having all those conflicts in my head. I usually just argue the points that help my side in a game, which greatly simplifies conflicts for me and which provides endless amusement to my friends. No, the answer to the question of why it seems wrong not to penalize wounded troops comes out of the great military philosopher Steven Colbert. Its the truthiness of it all. Wounded men just shouldn’t perform as well. Of course, other factors break down the performance of healthy troops – try not sleeping for a night or two, or sleeping under a thin blanket in a snow storm, or fighting after marching 15 miles before combat. I feel that long and elaborate calculations should be saved for the games that really need them. Like War in Europe, that mythic game of World War II that took longer to play than the real war (author’s note – I played it twice) and left the German player with he problem of calculating production on a giant board that required you to turn in a light tank unit for training and wait a year and a half before it could come back as a Panzer unit. 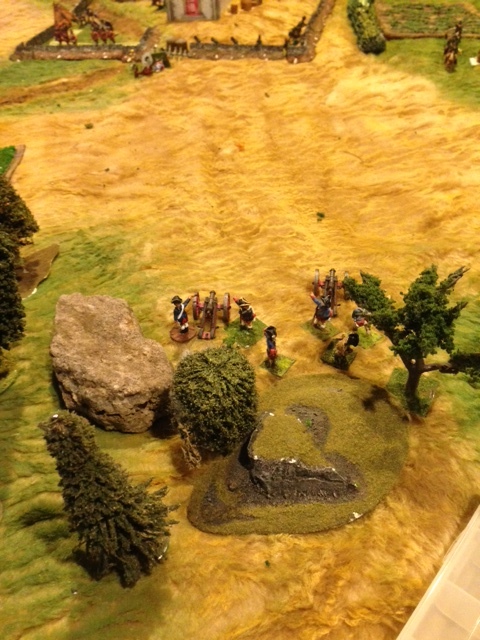 If you want the truth, an accurate representation of the Battle of Setauket wouldn’t be much of a game. If you want to do what the Americans actually did in 1777, start by replacing that stone church with a fortified Presbyterian meeting house. Then change the morale to reflect the fact that the British regulars I commanded were really Loyalists recruited from Queens. 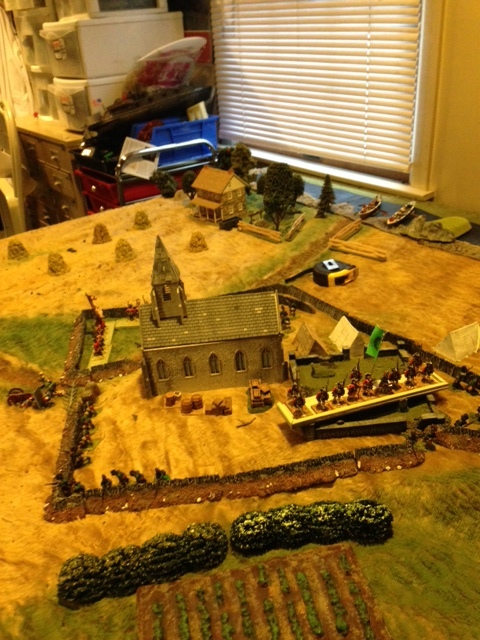 Angelo’ s game put the British forces behind a strong breastwork, which was accurate. 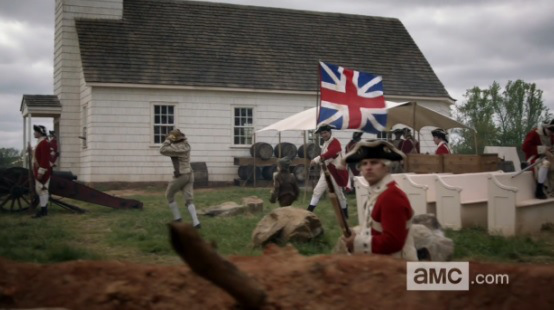 He even gave the Loyalists some swivel guns, which – as in real life – were not terribly effective. Finally, the Colonists should do what they actually did. Come across Long Island Sound in whaleboats, then march up to the fortified meeting house under a flag of truce and demand the surrender of the Loyalists. That leaves the surrounded British forces to retreat behind their defensive works and have a three-hour battle. Three game turns would be appropriate. After all, almost no one in the actual battle got hurt. Colonel Samuel Blachey Webb’s regiment had about 500 men. One was reported wounded. The cannons of the Colonial Army failed to damage either the works protecting the Meeting House or the troops within it. The colonial rebels withdrew after about three hours, fearful a British ship on Long Island Sound would hear the noise of the battle. And, they retreated with a dozen captured horses. Did I mention that Angelo’s game took about four hours to play out, and despite the one-sided losses, it was one of those fights which could go either way until nearly the last turn. The random card-driven system of activating units made every turn exciting and, eventually, balanced things out nicely. So, we ended up having a lot of fun, which is the point of the whole thing. A good time really was had by all. And, in the end, the rings had no real power over the players. Mitch Freedman, who worked as a reporter for more than 40 years before retiring earlier this year, started playing war games several decades ago. 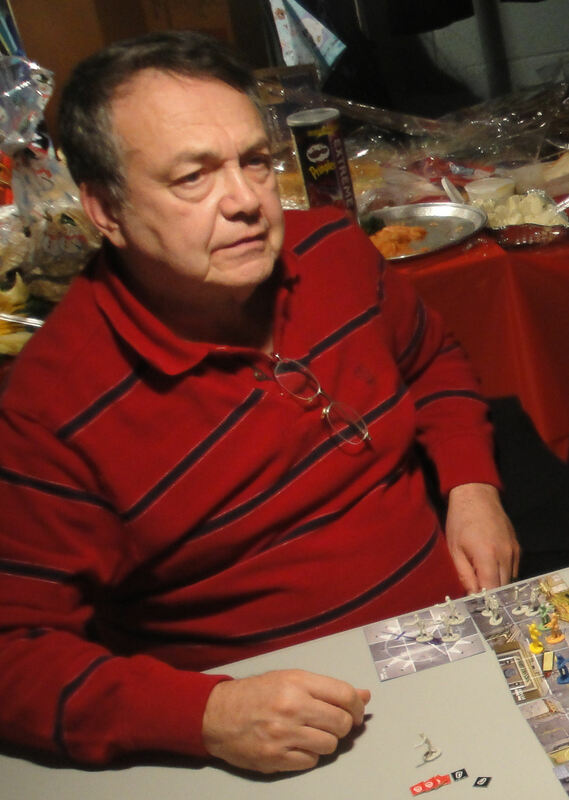 His basement is filled with game maps, lots of boxes filled with little cardboard game markers, and a nearly uncountable mound of other boxes of little metal and plastic toys, most of them 15 or 20 millimeter miniatures. He prefers games that demonstrate creativity of design and innovative game mechanics that purposefully focus on the situation to be simulated. His wife tolerates the time he spends gaming and their house full of pets including three dogs, three cats, a Bearded Dragon belonging to his grand-daughter and four turtles. Posted in Revolutionary War Miniatures and tagged Battle of Setauket, Colonial, Long Island, Redcoats, Revolutionary War, War of American Independence. Bookmark the permalink.